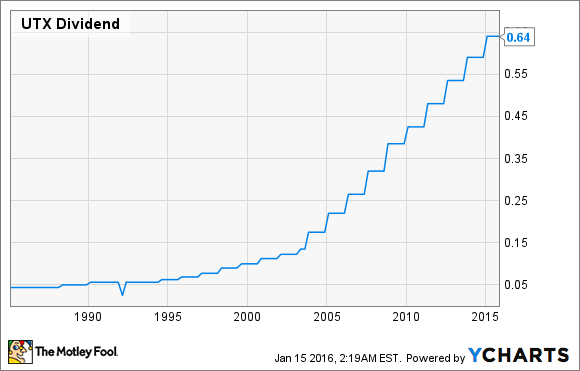 Will United Technologies Corporation Raise Its Dividend in 2016? A 22-year record of steady dividend hikes could fall by the wayside if it doesn't. Few companies in the industrials sector boast a record of consistent dividend increases as long, or as reliable, as that of United Technologies (NYSE:UTX). A steady dividend payer since 1936, it has not just maintained but raised its dividend every year since 1994 -- 22 straight years of rising dividends. And allow me to make this prediction right up front: 2016 won't be the year that United Technologies breaks its winning streak. I'd bet money on it -- and I'll tell you why. With a dividend history stretching back eight decades and a more recent history of consistent dividend raises, you have to figure that United Technologies' dividend is a key reason many investors own the stock. UTX Dividend data by YCharts. Currently yielding 2.8%, United Technologies' dividend is more than a half-percentage point higher than the average stock on the S&P 500 (SNPINDEX:^GSPC) pays. Together, these three factors -- the above-market dividend rate, the reliability of that dividend, and the expectation that United Technologies will adhere to recent past practice in continuing to grow the dividend -- work to secure loyalty among United Technologies stockholders. Reason No. 2: Why change? The simple desire to maintain course and continue doing business as usual is probably reason enough to assume that if United Technologies raised its dividend last year, and raised it the year before that (and raised it each of the 20 years before that), then it will raise the dividend again this year as well. As Newton's first law of motion states, "Every object in a state of uniform motion tends to remain in that state of motion unless an external force is applied to it." And, really, what "external force" is likely to impinge upon the general upwards movement in United Technologies' dividend payout? Analysts quoted on S&P Capital IQ predict rising revenues and earnings at United Tech as far as the eye can see -- at least out to 2019. And even today, the company devotes less than 40% of net income to dividend payments. That's a whole lot less than the 178% dividend payout ratio found at archrival General Electric (NYSE:GE), for example. Earlier this month, my fellow Fool Steve Heller crunched the numbers at General Electric and concluded GE probably won't raise its dividend this year. But United Technologies faces significantly less financial pressure than does GE. If GE might find it difficult to bump up its divvy in 2016, United Tech probably won't. Reason No. 3: Actually, go ahead and change... for the better! Actually, scratch that. Fact is, I do expect United Technologies to change its dividend this year -- by raising it. Because in addition to running a business that is firmly profitable, growing in profitability, and well able to fund its dividend already, it recently came into a $9 billion windfall through its sale of Sikorsky helicopters to Lockheed Martin. Management has already promised to devote $6 billion of that money to stock buybacks. Most of the balance will go to pay the government taxman. But even if nothing is left over for dividend hikes from the Sikorsky sale per se, the ability to earmark Sikorsky cash stock for repurchases frees up a lot of United Technologies' recurring free cash flow ($4.3 billion annually at last report, according to Capital IQ data) to spend on dividends, if management should be so inclined. With no clear reasons not to hike the dividend, but multiple -- and good -- reasons to stay the course, I expect United Technologies to do just that and raise its dividend yet again in 2016.